Catching a ride in something as quick and as chic-looking as a new Abarth Turismo brings loads of smiles and lots of fun! The Fiat 500 has been around for some years now and is often driven by those who enjoy something novel and unique. Without a doubt, even the standard Fiat 500 has the right looks for making the drive amusing. However, with the Abarth Turismo model there is a big step up in performance, handling and the all-important fun-factor. It starts on the outside. The Abarth Turismo can come finished in a striking twin-coloured paint finish that looks magnificent with the entire roof and bonnet finished in rich black, while the rest of the car is painted in a colour of your choice. You can opt for the regular single colour all over, but I love the way the two colours can really set this little car off. Yes, little the Abarth Turismo is in its pint-size dimensions, but look at the way the car turns heads with its set of very nice Abarth diamond-finish 10-spoke 17-inch alloys, low down driving lights, roof spoiler and low-slung air dam with mesh inserts. What the Abarth Turismo may lack in overall dimensions it certainly makes up for in style and excitement. This is not to say that in the front seats there is any lack of room. However, it is tight in the rear seats. Most people won’t be buying this for a family car, or even to replace the Falcon. But as a commuter and pleasure-ride for two, the Abarth Turismo has stacks of charm. 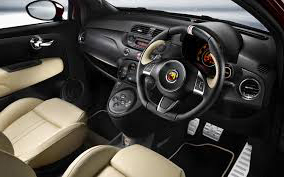 Inside the Abarth Turismo’s small cabin is a racy interior that will get your heart rate up for the drive ahead. Leather throughout, and boasting a nicely laid out dash that’s displayed in a distinctive sporty flavour, this is a car for the driving enthusiast. Aluminium pedals, footrest and kick-plates hint at the car’s performance credentials, so too do the Alutex gear knob and carpet set with aluminium inserts. My first impressions of the Abarth Turismo cabin is one of applauding the way Fiat have got this wee car very right. It’s a pleasure to spend time inside the Abarth, not only for the car’s performance, but also for the entertainment. Refinement is good, but not so good as to mute the burble of the snarling engine notes one enjoys when opening out the engine. Rightly so, this is all part of the special Abarth Turismo experience. The front Abarth leather seats offer good lateral support as they are bucket styled. Leg room is good in the front, and though you are aware of the small interior dimensions, Fiat has done very well in providing maximum space with handy storage compartments. Neat luxury items include things like a very effective air conditioning system that’s sure to keep your toes warm in winter and your face cool in summer. A tidy 7-inch TFT colour display lets you connect with on-board sound and communication systems. CD and MP3 radio with steering wheel controls and six speakers are standard equipment. A Blue&Me hands-free phone system is both safe and competent. USB port connections, Bluetooth and steering wheel controls give the Abarth Turismo plenty stylish mod-cons. Under the hood lies a T-Jet 4-cylinder petrol engine that has an in-line cylinder configuration. Sprint times are quick, and they always feel exciting. There is an abundance of power, and the Abarth Turismo happily sweeps passed open-road speed limits with ease. Just watch yourself though, as 140 km/h comes by in a flash! Fiat has given the 500 engine a power upgrade, and with turbo performance the 118 kW peaks at 5500 rpm. Claimed acceleration times are 7.4 seconds for the 0-100 km/h dash in standard 5-speed manual form, while the Abarth dualogic Competizione gearbox takes two-tenths of a second more. Plenty of pulling power is assured with a maximum torque of 230 Nm available at 3000 rpm. Handling composure is great, and the small wheelbase manages bumps in the road well, however is naturally on the firm side. The Koni front suspension has FSD technology and for very sharp handling and control. On the right piece of road you can hit well over 200 km/h which is very impressive for such a small and efficient engine. Five-star safety and braking performance that makes a Ferrari look tame; the Abarth Turismo is a dead-set winner for those on the lookout for a small, inexpensive performer that looks easily one of the best in its class. You just can’t wipe that smile off your face! For any more information on the Abarth Turismo, or for that matter any other new car, contact one of our friendly consultants on 1300 303 181. If you’d like some fleet discount pricing (yes even for private buyers! ), we can submit vehicle quote requests out to our national network of Abarth dealers and come back with pricing within 24 hours. Private Fleet – car buying made easy!